M.Sc,. M.Tech,. 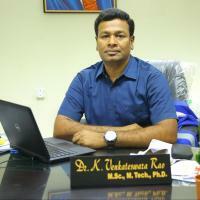 Ph.D(University Of Hyderabad),. PDF(Johns Hopkins, USA). Experience in teaching with a wide range of subjects including Quantum mechanics, nanomaterial, Characterization techniques, Sensors etc. Wide spectrum of Ph. D research scholars with different back grounds at their Graduate/Masters level in ECE, EEE, Mechanical, Biotechnology, Physics and Materials Science, gave me more scope to enter and approach to different areas of research. I'm always willing and ready to walk the extra mile and put in the extra effort in work.